It's a fact of the digital life: Files pile up. And users tend to pile up the same files over and over. So how would you know that two huge files are really the same file before you delete one of them? What about the .CSV files that your team has been updating in multiple locations -- how do you keep those in sync? One tool that can help you eliminate duplicates, merge changes from multiple sources and keep directories in sync is Scooter Software Inc.'s Beyond Compare 3. When installing this application, you can choose to do either a standard install, which creates the usual directories and uninstall entries, or a "portable" install, which dumps everything into a directory that you choose. This is great for adding to a management USB key or CD that you take with you. Upon launching Beyond Compare 3, you start a "session" of one of the three aspects of functionality: Compare, Synchronize or Merge. The Compare group is split into the different types of file or directory comparisons you want to do. Comparisons include Folder, Text, Data, Hex, Version, MP3 and Picture modes. With Folder Compare, you can specify whether to compare file sizes or time stamps, ignore time-zone or Daylight-Savings offsets, and run file attributes among numerous other filters. With Text Compare, you can make choices such as which grammar elements are important to the comparison and whether to ignore different types of white space and line endings. Data Compare compares your .CSV files row by row and shows you which data is changed or missing in various files. For Hex Compare, you can specify the number of bytes per line and the alignment to ensure that binary files from different systems are truly identical. If you use source control for your administrative scripts or sideline as a developer, you'll also appreciate the built-in source control integration functionality. There are numerous plug-in providers for source control, including support for CSV, Subversion, Sourcegear Vault, Visual Sourcesafe and Microsoft Team Foundation Server, among others. 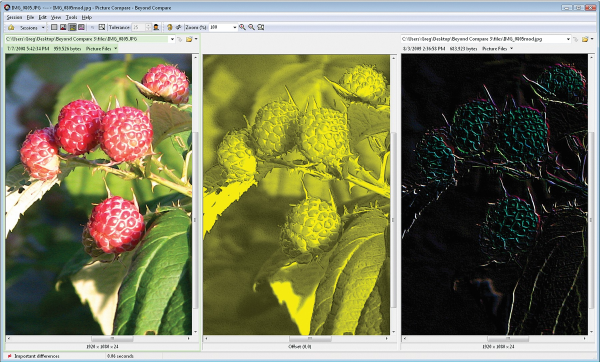 The Version Compare option helps you detect the differences. MP3 Compare checks ID3v1 and ID3v2 tags, as well as the audio data if you so choose, to ensure that your music files haven't been tampered with. Picture Compare lets you check tolerance, range and binary XOR/AND/OR operations against the bits to see whether and how a photo was modified from an original. Folder Sync allows you to do one- or two-way synchronization between two locations using all the File Compare options to determine which files should be copied over (or to choose to leave files that are different alone to ensure that you don't lose any data). You can also specify a file filter to synchronize only certain types of files. Once you have your Folder Sync session set up and saved, you can write a simple custom format script along with a scheduled task to automate the synchronization. Text Merge smartly highlights the differences between two files and lets you merge selected changes into one or the other to update it. For each session type, you can edit the defaults to your liking to speed your next comparison, synchronization or merge. Each session is in a tab on your work space within the application, so you can have multiple sessions open at once. The tool also auto-saves your sessions so that you can quickly hop back into a frequently used comparison. Beyond Compare 3 is available for Windows and Linux. The Pro edition will run you $50 per user per platform for one to four users with volume discounts available as you add users. A dual-platform (Linux and Windows) license is $80. A Standard edition, which strips out some of the Pro features, is available for $30. With all these features and a relatively low cost, Beyond Compare 3 takes comparison, synchronization and merging of files and directories well beyond ordinary levels. Sometimes when you're troubleshooting or setting up a new machine in your environment, you need an outside "opinion" on your external IP address as it appears to the outside world. One quick way to accomplish that is to hit whatismyip.com from the browser on the system. 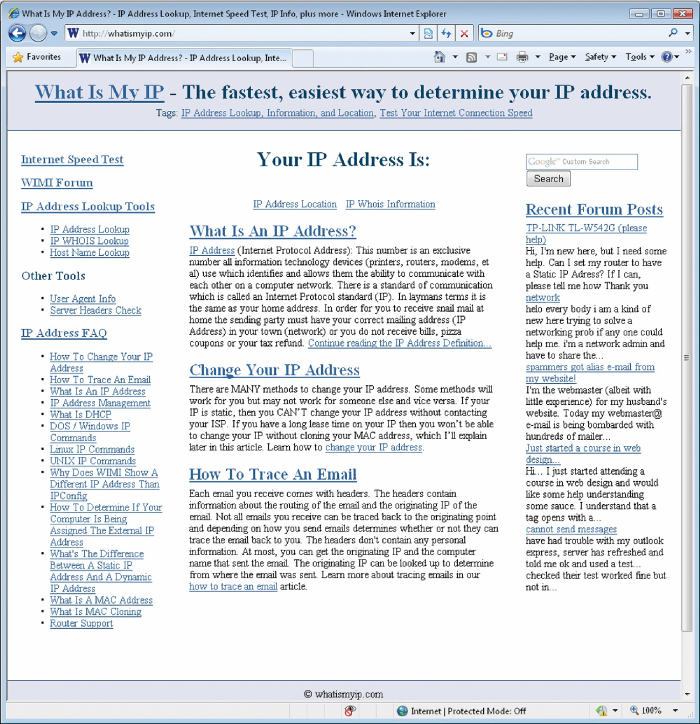 That site's homepage displays your IP address in big, bold letters, along with quick links to get the IP address location information and IP Whois Information for that address. The IP address location information is powered by the IP2Location database and shows you country, state or region, city, postal code, approximate latitude and longitude and the time zone of the IP address. You can also see the host name, the domain name and the ISP for the address. The IP Whois lookup will, in turn, give you detailed information on the registration information for the IP address, from the allocated block of addresses to name-servers and contact information (much like a domain-name Whois lookup). You can use both these tools on any IP address as well -- you aren't limited to the address where your request originated. Other quick look-up tools on the site will show your current User Agent string from your browser, as well as your screen resolution and host name. Another tool lets you query a domain or IP address to retrieve the server headers, which can show you what type of Web server is hosting the site, the response code from the request, the content type and the ASP.NET version, among other details (that is, assuming that site security hasn't obfuscated some of those details as a security precaution). The site also offers a simple Internet Speed Test that lets you test against one of four locations: New York City, Atlanta, San Francisco and Chicago. Picking the location closest to your ISP will usually give you the closest approximation of your Internet connection and show you your current downstream and upstream connection. The site also has a number of useful FAQ documents on topics such as "How to Trace an E-mail" and "What is MAC Cloning?" So the next time you have a question about your connectivity or want to know who holds the registration for an IP address, look to whatismyip.com for a quick answer. Ever been moving around quickly while managing or cleaning up your Active Directory (AD) domain and delete something that you shouldn't have? Or perhaps you're worried about a new staffer who's got the ability to delete objects from the directory. Let's face it: Mistakes happen, even with all those confirmation dialogs. Windows Server 2008 R2 adds its own Active Directory Recycle Bin feature, but if you haven't been able to upgrade your domain yet, or you're looking for an alternative way to manage this new feature, you might want to check out Overall Solutions Inc.'s free tool, ADRecycleBin. This easy-to-use utility is a single 500KB executable, so you can add it to your management USB key or CD so that it's handy regardless of your location. Then, when you delete an object from AD, it doesn't really get deleted; instead, the "isDeleted" attribute is set and it's moved to a special CN called Deleted Objects. These objects are known as "tombstones." The tool grabs all these tombstones and lets you restore a set of them at one time. When you load ADRecycleBin, it connects to the domain controller and shows you the current Forest functional level, the Domain function level, the current domain and what type of RecycleBin functionality is available. For Windows Server 2008 R2, you can tie into the Active Directory Recycle Bin; for earlier versions, you can "re-animate" deleted objects. You can also filter the type of objects you wish to load with three check boxes: Users and Computers, Groups, and Other. Clicking on Load Deleted Objects does just what you'd expect; once your set of tombstones is loaded, you can click on individual AD objects to see the detailed property view of that object, including sAMAccountName, SID, CN, lastKnownParent and whenChanged, among others. Next, just select the items you want to restore and click Restore Checked Objects. ADRecycleBin is an easy, simple and free way to manage your mistakenly deleted AD objects -- and definitely worth consideration as an addition to your IT toolbox. The opinions expressed in this column are solely those of the author and do not necessarily reflect the opinions of Microsoft. Prices were confirmed at the time of writing and are subject to change. **Greg Steen,**a technology professional, entrepreneur and enthusiast. He's always on the hunt for new tools to help make operations, QA and development easier for IT professionals.